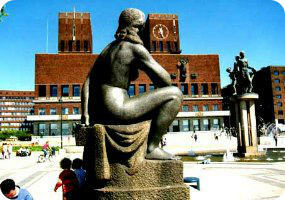 Book now the best shore excursions in Oslo. High quality and safety at the lowest prices. If your are looking for Shore Excursion Oslo, book now the best guided tours at lowest price with Ancora Tours. Since 2003 we offer you official guides in english, transportation and travel insurance, all included. The highest quality at the lowest rates. Oslo has been the capital city of Norway since the fourteenth century and is now one of the most modern cities in Europe. It is a vibrant city that offers all different kinds of culture which is enjoyed by easy going locals. Put your name on the list, our shore excursion in Oslo is about to start! What’s eating: Smørbrød: a Norwegian open sandwich. Souvenir: Wood carved ornaments of typical Norwegian symbols such as trolls, vikings or folklore characters. Keep your eye on those coins though – Oslo has a reputation for being expensive. Oslo is consistently ranked as one of the top cities for quality of life so there’s lots of important cultural sites to see in our shore excursion. We’ll see the National Theatre, one of Norway’s most prominent venues for the dramatic arts, and we’ll see the grandiose Royal Palace. This 19th century royal residence has a whopping 173 rooms and is surrounded by the Royal Palace Park on all sides. At the Vigeland Sculpture Park, we can admire the masterpieces of the much-loved Norwegian sculptor Gustav Vigeland. With more than 200 bronze and granite sculptures to admire, this outdoor museum is one of the country’s most popular tourist attractions. Before our Oslo shore excursion leaves the centre, we’ll visit the National Art Gallery, which displays works by Munch, Monet and Picasso. Then, we’ll head to the Viking Ship Museum and delve into this Old Norse society. The museum contains the well-preserved Oseberg ship and many artifacts and everyday items which were found within it. Next, we’ll examine a different aspect of Norwegian life and stop by the Holmenkollen National Ski Arena. Look out for the futuristic ski jump which is made from 1000 tonnes of steel and stands 60 metres high.